Steel and Bronze windows have been used since the 19th century, taking over from the early wrought iron cottage windows. Traditionally they are known for their slimness of frame and also can have attractive turnbuckle and stay details. 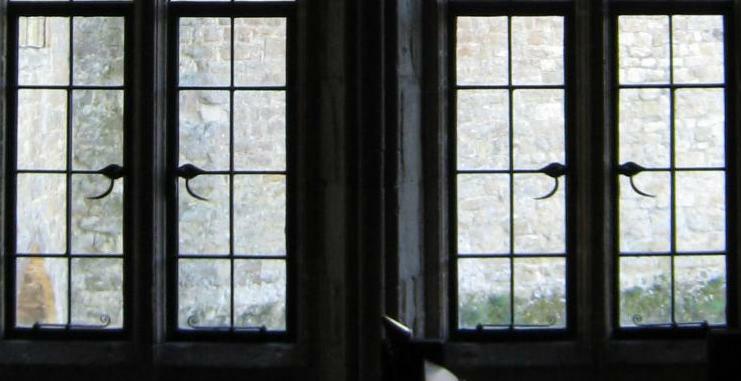 A number of companies have developed double glazed steel windows,which minimise the increase in frame size, though on listed building there is generally a presumption against double glazing and you should consult with your local Conservation Officer if considering this. Belton Park, Londonthorpe Road, Grantham, Lincolnshire, NG31 9SJ. Architectural Bronze Casements are beautiful handmade metal windows offering an exciting and traditional alternative to steel windows. Made from architectural bronze, they are usually incorporated within stone mullions, brick or timber openings. For older properties, the combination of our sympathetic casement design coupled with its ability to house an extremely efficient slim double glazed unit has enabled us to provide a solution that not only complements the façade of any structure, but also reduces heat loss. We also design and make a range of bronze doors and bronze secondary glazing. Whilst the Company carries out a wide range of architectural metalwork including shopfront, in heritage terms it is known for its bronze metalwork including repairs and refurbishment as well as new windows and doors. Clement manufacture an innovative range of steel windows, doors and screens. We provide a complete service - from the provision of technical drawings through to manufacture, installation and after sales support - whether your project is a traditional restoration project, one involving Listed Buildings or Conservation Areas, or a new build. All of our windows are crafted to your bespoke design in our ISO 9001 approved factory. Produced entirely from 100% recycled steel and generally Part L compliant, our windows are environmentally friendly and meet the latest performance requirements for insulation, weatherproofing and security. With Clement Windows you can expect technologically advanced, yet low maintenance steel windows, which will last for many years. With over 150 years of experience, Crittall Windows is ideally positioned to undertake the replacement of windows in buildings of historic or architectural merit. Whether it is a 1920's Art Deco building or a 1960's tower block Crittall can replicate original designs while offering class leading performance and durability. Their technical and design teams are able to offer guidance to ensure that the original architecture is preserved. Their technical advisors can survey the fenestration to determine the original sections used and the method of fabrication and site assembly and select a Crittall product that retains the character of the building. Holdsworth Windows founded in 1967 specialises in manufacturing steel windows and leaded lights and employs their own fixing and glazing teams. They can manufacture a variety of sections including angle iron frames, light universal, standard sections or W20. There is a choice of fittings including brass, and wrought iron made in their own forge. They also produce leaded lights in clear or handmade antique glass, and supply and fix leaded double glazed units. The Steel Window Association (SWA) represents UK steel window manufacturers and suppliers, ranging in size from the smallest, craft-based companies which specialise in replacement and repair work through to large, multi-site companies that manufacture and install windows in all types of buildings. The SWA works with English Heritage to promote the important conservation message that metal windows can be cost effectively renovated or replaced by skilled tradesmen. With over 30 years’ experience in the traditional leaded light industry, Touchstone's patented Insulead® glazing system and Steelyte® opening casements were designed specifically to overcome the problem of double glazing windows in a heritage building. Our patented, frameless, high performance double glazed units fit directly into stone which along with our stainless steel opening casements offer a glazing solution made of stainless steel designed to have the delicate look of a traditional metal window whilst offering high insulating properties.